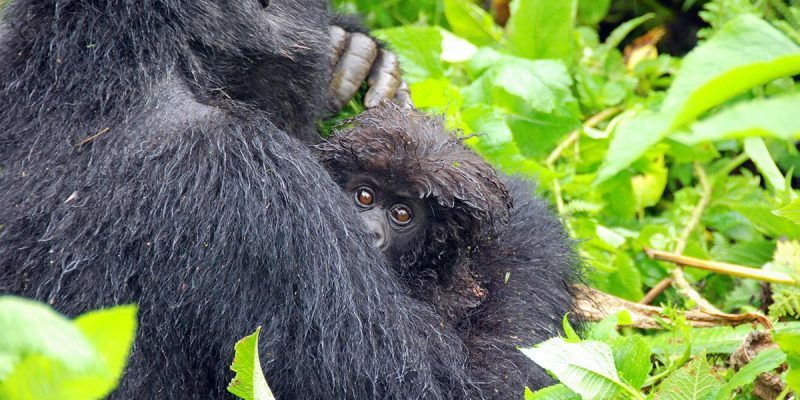 The 6 Days Gorillas, Chimpanzee & Wildlife Safari offers you an opportunity to look into the eyes of the endangered Mountain Gorilla in the dense forests of Bwindi National Park, see an assortment of the Savannah wildlife and Chimpanzees in Queen Elizabeth and also featuring thrilling adventure activities you must not miss while on a tour to Uganda. As usual a briefing on the Gorillas, Chimpanzee & Wildlife Safari from gorilla safaris Uganda agent/ guide before we drive westwards towards Fort Portal to the Kibale Forest National Park (about 5 hours). Traveling on both asphalt and unpaved roads, you pass through traditional Ugandan Villages where you see people at work tending their traditional crops of millet, sorghum, beans and maize. The lush rolling hills of this region provide good “photo opportunities”. As you approach Fort Portal in the foothills of the Rwenzori Mountains, you enter Uganda’s famous tea plantation region. A carpet of green spreads before you, as far as the eye can see, and seems an unusual contrast to the countryside through which you have just passed. You arrive at Fort Portal, then, continue toward Kibale Forest, one of the great African rain forest research reserves. Years of study by scientists (who have cut a grid through the forest) have habituated many of its animals to human observers. This forest is famed for the variety of primates found here and it is a terrific area for birds. This rural Ugandan town (Fort Portal) is locally famous for its weaving and basketry, and we can spend some time briefly to examine some of this local art. The Gorillas, Chimpanzee & Wildlife Safari route takes us to Fort Portal, a small and attractive city. The fort was built between 1891 and 1893 and named after Sir Gerald Portal, the British Consul General of Zanzibar who arrived in Uganda in 1892 to formalise the protectorate of Uganda. He died of malaria a few months after the fort was completed. During the afternoon we have time to visit the scenic crater lakes region, checking out the superbly terraced tea estates. In the south of Fort Portal is Kasenda Crater Lakes region. It sits on the rim of Lake Nyinambuga—the back of the main building looks down over the lake, while the other side of the lodge looks out over another lake in the distance and, further off, the Rwenzori Mountains, which were perpetually shrouded in the clouds, except early in the morning. There’s plenty to do in this area and we can also take an hour’s walk around Lake Nyinambuga. Budget Tourist: Kibale Forest Camp. The Gorillas, Chimpanzee & Wildlife Safari group will assemble at Kanyankyu River camp at 0800hours to go for the most popular activity in this park which is Chimpanzee tracking. Chimpanzees are man’s closet cousins though they are one of the most threatened primate’s species. More primates like Black and white Columbus monkeys, L’Hoest Monkeys, Grey cheecked Mangabey, Red tailed monkeys, bush babies, pottos and many bird species like the spotted nicator, rumped tinker bird, Little greenbul, green breasted pitta, the crowned eagle, black bee eater and mammals like Elephants can be seen in this walk. Typically, we locate the chimps by listening for their pant-hooting calls, then hustle to the area from which they are calling. We get to observe them as they feed in fruiting trees, lounge, and socialize with each other, or even, occasionally hunt. In the afternoon we visit a nearby forest swamp that is excellent for viewing primates and other forest animals. At the Eastern edge of Kibale forest is Bigodi Wetland sanctuary which is maintained by the local community. You will expect birds like the great Blue turaco, blue monkeys, baboons, otters, mongoose, bush bucks, bush pigs and among others. Budget Tourist: Rwenzori View Travelers Hotel. Either a Gorillas, Chimpanzee & Wildlife Safari day’s walk in the foothills of the Rwenzoris, one of the great mountain ranges of the world, looking out for its forbidding peaks in the distance, or drive straight to Queen Elizabeth. The game seen will depend on the season; the Kasenyi plains are good for lion and the Mweya peninsula for a variety of animals. Shift to Queen Elizabeth National Park this morning (about 3 hours driving). Leaving through Fort Portal town, you turn south and early this afternoon enter Queen Elizabeth National Park, which is dominated on its northern border by the snow-capped 16,000-foot Rwenzori Mountains – the famed “Mountains of the Moon”. This 767-square-mile conservation area is bordered on the North East by Lake George and on the South West by Lake Edward; its western border adjoins the Zaire Parc Du Virunga. You will expect to see teeming herds of impala-like Uganda Kob, as well as topi, elephant and lion, giant forest hog, Cape buffalo. There are also several soda lakes filling ancient volcanic calderas where flamingos reside seasonally. In the afternoon enjoy a game drive in the northern part of the park, visiting the Baboon Cliff famous for its nice scenery, and good views of the shadows of the mountains of the moon – the Rwenzoris. The drive to the lodge leads through large expanses of savannah grasslands and plenty of wild game. We set out the Gorillas, Chimpanzee & Wildlife Safari day eearly in the morning for a game drive in the northern part of the park on the Kasenyi Track in search of lions, elephants, solitary buffaloes. This is the best time for opportunities of viewing the cats in action owing to the vast population of Uganda Kobs. We have an excellent chance to view just about every animal here at very close range. In the afternoon we will go for a launch trip along the Kazinga Channel. This gives you the opportunity to view wildlife up close: hippo’s huff and spray at a mere feet away from the boat, buffalo linger in the shallows. The shores of the channel are also home to an array of birds including pink backed pelicans, pied and malachite kingfishers, saddle billed stork and many others. Budget Tourist: Mweya Albertine Hostels. Mid-morning after breakfast we drive further south through stunning savannah grasslands as we head towards the breathtaking Gorillas, Chimpanzee & Wildlife Safari adventures of Bwindi Impenetrable Forest National Park. Either (roads permitting) we will pass the southern sector of the park – Ishasha, a remote and beautiful extension of Queen Elizabeth National Park that is host to a large variety and volume of wildlife. (It is a fabulous site to see the lions draped from the trees and nowhere in Africa do you stand a better chance of seeing this than in the large low limbed fig tree of Ishasha). Or take the alternative route through cultivated expanses. The Gorillas, Chimpanzee & Wildlife Safari jungle adventure day. After breakfast, proceed for the morning briefing before enjoying the highlight of the trip- Gorilla trekking, which may last the entire day. We trek through the rainforest and bamboo covered slopes, accompanied by a guide and trackers, in search of a mountain gorilla family. While most of today’s forests are no more than 12,000 years old, Bwindi’s vegetation has been weaving itself into tangles over at least 25,000 years, in the process accumulating a lengthy species list. This includes 310 species of butterfly, 51 reptiles, 200 trees, 88 moths and an exceptional 120 types of mammal including 10 primates. The latter includes chimpanzee, L’Hoest’s, red tailed and blue monkey, black and white colobus, baboon, and Bwindi’s most famous resident, the mountain gorilla. Early breakfast before embarking on our return to Kampala, driving down the grassed and terraced escarpments of southwestern Uganda while taking in the breathtaking sights of the hills of the region dubbed ‘the little Switzerland of Africa’. This area is a highly fertile, mountainous region with steep sided hills covered from top to bottom in neatly terraced cultivated rows. Not to miss as we traverse Mbarara are the impressing long horn Ankole cattle. A remarkable highlight of this journey is the Equator line and surely you will cross it as we have a brief sop here. We will be in Kampala in the evening before for your flight back home.